He was about twelve years old, at a Boys Brigade camp on the west coast. One day the lads had to sign up for an activity. The sign up sheets offered a choice of Fishing, Swimming or Visit To BMX Factory. Visit To BMX Factory! Hell yeah! Gareth and his bike-obsessed pals signed up in a flash. Imagine their heartbreak when they arrived at the BMX Factory only to discover there had been a terrible misunderstanding caused by messy handwriting on the sign-up sheet. 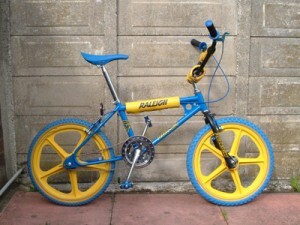 BMX Factory was actually BMK Factory… makers of quality carpets. What an odd set of options…seriously? A carpet making facility?? Brilliant!! I am sure I heard Obama mention this story yesterday! My husband and I believe this was a ploy arranged by someone that wanted to keep their job promoting the carpet factory….I mean seriously? Fishing and Swimming and…..Carpets??? Yep it was rigged and messily written on purpose! Also, Kirkcaldian is a word. Enough of this Langtonian shenanigans, I’m going to make this stick! Oh wow Scotland had so much to offer in the way of floor coverings! PS I like Kirkcaldian, too! Poor wee boy but great story now. Wonder whether the Boys Brigade leader was getting it on with the secretary. My childhood visit to a local carpet factory (-my friend’s father’s) entailed sliding down chutes quite fun but definitely not BMXs. Poor, poor Gareth. I have a therapy slot open later in the week…lol! I read this while having a sneaky skive at my desk but ended up guffawing with laughter into my keyboard. Stealth is definitely not my middle name. I am laughing so hard! Stealth isn’t a word you can apply to me either! The Boys Brigade must have a underlying agenda to encourage the aspirations of not so bright, hard working lads. Not going on to Uni, you could have a bright career in… dum, dum, dum, CARPET MAKING! loved the story, but still slightly disturbed by the “constant feeling of being slightly disappointed by life” . . .
I’m sure the carpet factory was very interesting too…ha ha ha! When I was in primary school, it was announced one day that the class was going on a trip to the Flying Circus. In my mind, this circus was perched at the top of a very long pole, miles and miles in the sky, and that’s why they called it the Flying Circus. Imagine my disappoint when we arrived at an entirely earthbound location, called the Shrine Circus. Oh man! A carpet factory? wow. I was about three when my parents took me (and probably my brothers) to some place or other, maybe a petting zoo, that offered a donkey ride. It is one of my earliest memories. I completely understand now why this would not have been possible, but I still remember how disappointed I was.